Is this what 10.5's Spotlight will be? We get bombarded with electronic documents - mainly PDFs - every day. Keeping them organised requires discipline; folders, subfolders, categories and a blizzard of PDFs and documents - it's not an easy process. Ironic has taken a simple premise: what if we could view our documents in the same way iPhoto works? Yep stops sifting through interminable PDFs from feeling mundane. On startup, the program automatically scans your drive (or wherever you tell it to via Preferences), and assembles a clean palette of your PDFs, in Preview format. You can zoom in or out and you can even make use of a handy loupe magnifier to give you close-up examination of the smaller details. You can have all of your PDFs on one screen, instantly viewable and unmoved from their original position. By tweaking Preferences, you can add other external hard drives, disk images and network drives. By clicking the Collections button, you can view previously saved searches, making it a cinch to keep on top of current projects and how they've altered. 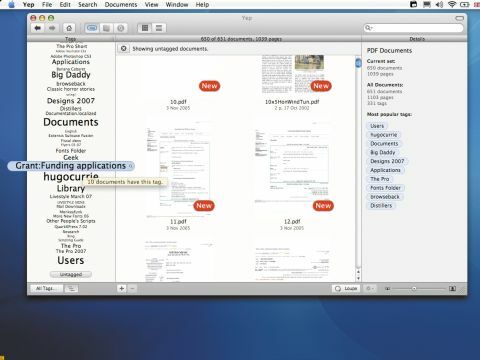 Altering the tracking setting can give you a view that mimics Finder but eliminating folders that don't contain PDFs. However, the master stroke is tagging - you can add keywords to your documents, creating your own loose affiliation to make organisation even easier. The Tagging Cloud on the left of the viewer tells you the most amount of tagged docs, by the size of the word. Smart, eh? Your own tier of organisation by association. You can also pair Yep to a scanner to file paper docs, and in Word a subheading on the Print > PDF page allows you to Save PDF to Yep. YepShot allows you to make an instant PDF snapshot of any web page and add it to your Yep viewer.